as if she were trained to it. would fall to her in battle. Poet's Notes: I often write a group of poems around a common theme, and, late last year, I wrote several Arthurian poems. I wrote poems about Arthur, Guinevere, Lancelot, Arthur's soldiers, even Arthur's dog. 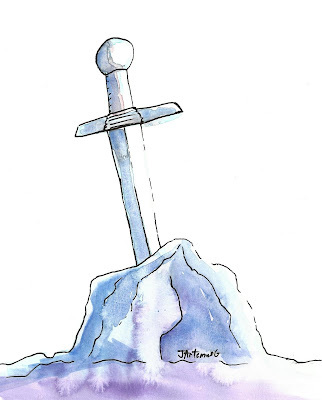 Then I strayed further from the familiar legends, wondering what might have happened if someone else had pulled the sword from the stone. This poem says it all, doesn't it? From that "as if she were trained for it" when we realize the impossibilities sealed in those two words, to the devastating "momentary hesitation" which seals future centuries. Today's sparrows will see, hear, and witness quite a different unsheathing. Thank you very much for your comment! I appreciate it!